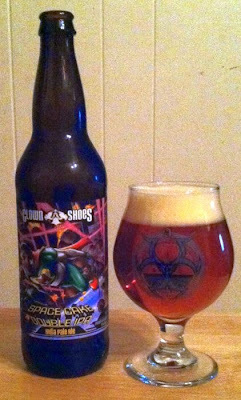 Clown Shoes Space Cake Double IPA is aggressive. I really like it. It reminds me of Avery’s Maharaja, thought not as complex. It has a copper color with lots of suds and persistent lace. Very strong hop aroma; bitter and sweet notes, something like marmalade and newly cut grass. Buttery malt on the front of the tongue, then huge hop burn at the swallow, and some sweet vapor in the end. Very nice.